No mention of independent review board requested by historians. Washington, D.C., March 17, 2005 - After a group of historians plus the American Library Association last week protested the lack of public access guarantees in the proposed transfer of President Nixon's tapes and files to the private Yorba Linda-based Nixon Library & Birthplace, Nixon representatives have now assured the National Archives that the Nixon Library will donate to the Archives the "personal/political" portions of the tapes and files -- which former President Nixon and his estate litigated for more than two decades to keep from the public domain. 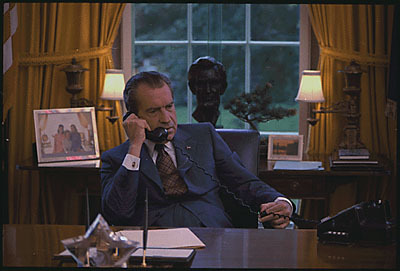 The pledges from the Nixon Library are described in a March 14, 2005 letter from the new Archivist of the U.S., Allen Weinstein, to John H. Taylor, the Nixon Library director, Taylor's reply of March 15, 2005, and a summary of the Weinstein-Taylor exchanges prepared by the National Archives and posted today on the Web site of the National Security Archive, which posted the historians' protest letter on March 10. The pledges exchanged this week do not provide the binding legal commitment on the Nixon Library's part as urged by the historians, but do seem to represent clearly the bottom-line requirements of the National Archives before the Nixon Library would join the Presidential Library system. The pledges also do not include any reference to the final recommendation from the historians' group, that the presidential libraries need an independent review board or boards to ensure maximum public access. "I'm tempted to do what one senator suggested to LBJ on Vietnam, declare victory and get out," commented Thomas S. Blanton, director of the National Security Archive and a signer of the historians' letter. "Isn't it amazing what outside scrutiny and pressure can accomplish? But until there's a binding legal agreement, and the donations are in hand, we need more independent review of all these deals."